micaela is using Smore newsletters to spread the word online. 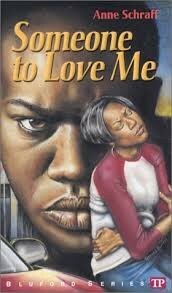 Someone to Love Me is a book about a girl named Cindy. She is a girl who feels alone. Her mother is always hanging out with her boyfriend, therefore she doesn't get a lot of attention from her mother. Her boyfriend is a man who is involved in drug dealing. She meets a boy in school named Bobby. He is a dangerous boy always getting into trouble. Is it to bad for Cindy to feel loved? Cindy is a girl who goes to Bluford high school and has a best friend named Jamee. Some of her physical characteristics are that she is black hair and hazel eyes. Some emotional characteristics are that she feels alone and not loved. Something that motivates her is drawing cartoons for her school newspaper. The conflict that Cindy is going through is that she is starting to feel alone and she feels like no one likes her or loves her. What I like about the book is that some people can actually relate to it and it can happen in the real world. I think other people should read it because it can possibly help you if you are ever in a situation and some teenagers can relate to what Cindy was feeling in the book. Anne Schraff is the author of Someone to Love Me and many other books in the Bluford Series. She was born in Cleveland, Ohio. She was born on September 21, 1939. Schraff taught high school in San Diego, California. She has a brother and a mother, but her father died when she was three. She has sold over hundreds of stories and is a great author for many different historical fiction, biographies, science books, and fictional books for young people.